Vaping has been legal in the UK for a few years now, but that’s not the case in every country. Thailand is a notable exception, which not all people travelling there are aware of. More is known about vaping now than ever before because the products have been commercially available for over a decade and researchers have had time to look into their benefits from a health perspective too. Let’s look at what the various benefits of vaping are both for the user and people who are near them when they are busy vaping. When you walk into a vape shop in the UK, you’re faced with a wide choice of vaping products, vape flavors and the strength of the nicotine. For people who enjoy buying online for the convenience, Grey Haze is a good vape shop that offers a range of flavors and items. They have e-liquids, e-cig kits, and other products. You’re bound to find something that helps you through your transition whilst tasting good. While taking in nicotine isn’t wonderful for your health – and vaping usually includes nicotine too – the far greater risk to health is from tobacco. When a regular cigarette is lit, the tobacco lights up, which creates a mix of chemicals that are carcinogenic; in other words, they can help to produce cancer. The greatest risk with regular smoking is developing mouth or lung cancer or having either heart problems or a respiratory disease. Due to the fact that vaping doesn’t produce smoke with these chemicals, it’s less dangerous to people in the same room or passers-by. The yellowing effect on furniture fabric, clothes and teeth that is caused by the tar from regular cigarettes isn’t present when vaping. This is because there’s no tar produced. For past smokers who were forever having problems keeping their teeth pearly white or their home not taking on a yellowish tinge when they smoked indoors, vaping produces a good way to avoid it for good. Unlike with cigarettes, there are few chemicals to be concerned about. Some chemicals are used inside the e-cig, which help to act as a vaporizer to the nicotine, but these are only vegetable glycerine and propylene glycol. There are also some additives put in there and the flavoring in the juice. While the vaping cloud is less noticeable than a regular smoker’s cloud and will smell of the juice flavor, it’s inoffensive to most people. Anyone who has asthma can tell you that they struggle with cigarette smoke. This affects smokers, but most of all, anyone who comes into contact with the smoke second-hand, even from a considerable distance. The smoke contains up to 4,000 chemicals, some of which can cause throat irritation, which leads to an asthma attack where the throat begins to close up. This can be potentially harmful and dangerous if the asthma sufferer isn’t carrying their inhaler with them. The vapors from active vaping don’t cause the same reaction in asthma sufferers because of the lack of problematic chemicals in the e-cig. They might be initially concerned about the vapors wafting in their direction until they realise it’s not coming from a regular cigarette and isn’t causing them breathing difficulties. If they’re not familiar with vaping, then they may even ask questions about it. Smokers who suffer from COPD, which is a group term that covers various lung diseases including chronic bronchitis, permanent asthma, and emphysema have seriously impaired lung functionality. Just taking a breath is a struggle and they have less access to their full lung capacity, which doesn’t make it any easier. Vaping instead of smoking cigarettes often boosts active lung capacity by 15-20% because COPD sufferers are no longer actively impacting their own lung functionality by smoking harmful cigarettes. Stopping a pack-a-day habit is no small thing. Nicotine patches work for some people, but the physical act of smoking is hard to break too. When there’s nothing replacing the physical hand movement of smoking, it feels like a void and it’s difficult to get around that fact. With vaping, smokers can make the switch better because they’re holding a modified form of e-cigarette which doesn’t feel too different to a tobacco version. This stops them feeling like they’re missing something. It even works for chain smokers who burn through multiple packs daily at great expense. Vaping can be used to drop the smoking habit over time. It is also a useful way to gradually reduce an addiction to nicotine because vapers can purposely choose the amount of nicotine in their vaping products. Vaping occasionally to get a quick nicotine fix can save money vs maintaining a serious smoking habit. Sticking to a couple of regular flavors and a single brand makes it possible to reduce the cost of vaping because of not mixing and matching. When avoiding building up a collection of vaping kits and flavors to become more of a connoisseur of vaping, it holds down the cost. There’s also no need to buy ashtrays for every room in the house either. 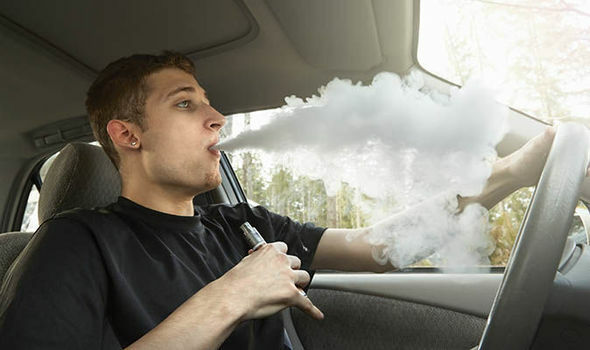 If you’re carpooling and grabbing a quick lift from a friend or co-worker, they often don’t mind if you vape while in the car with the window down. This is because there’s no harmful smoke and the smell is mildly pleasant and not obnoxious. This is more likely to be the case when they’re already familiar with how an e-cigarette works and that it’s not unpleasant or harmful to them to be near it. It’s also not a fire hazard either. One of the joys of vaping is being able to pick out a vape juice that you particularly like. Juice manufacturers cater to many different tastes, so there is a huge range of different flavors to choose from. Whether you’re into chocolate or caramel, or you enjoy the taste of fruits like strawberry or apple, there are several products that can deliver a delicious taste and smell to match. And if you want a possible nose clearing kick, then a menthol flavor could work for you too. Try a few brands and flavors to see which ones your favorites are. Then you can stock up on those to avoid running out when you want to vape unexpectedly. There’s no littering with vaping. You’re not dropping ash on the ground as you walk around or snubbing out cigarettes with the heel of your shoe either. Products are all neatly packed, easy to carry and dispose of discretely. As you can see above, there are many benefits to vaping. The fact that it’s less harmful to you and far less intrusive or annoying to other people in the vicinity are significant plus points on the health and social aspects. It’s far more socially acceptable right now at a time when regular smoking has halved in usage across many age groups since the producers were banned from advertising. By contrast, vaping is on the rise as a fun pastime and as a useful way to get off cigarettes. You just have to pick your favorite brand and flavor, and you’re ready to enjoy the experience. I have been doing it for almost 9 years and I can guarantee that it doesn’t have as much effect as the people have shared articles and videos on internet. Yes, it does reduce some stamina but again not that much harmful. I agree with you on the point it is better for Asthma suffers.